Do you use an antibacterial soap to keep your skin healthy and clean every day? Using antibacterial skin cleaning products can help you take care of your skin as there are many harmful bacteria residing on the skin and these soaps contain antibacterial agents which kill these bacteria. Skin infections are very common and they spread easily so keeping an antibacterial soap in your bath cabinet works well in safeguarding you and your family from infections. This antibacterial soap from Safeguard is available in 44 sizes and 7 variants to choose from and aims to kill 99% of the bacteria. It is a triclocarbon deodorant soap which also keeps body odour under control. The soap is suitable to use on face and body and works well as a hand soap also to keep your hands clean. The soap has a pleasant smell and rinses well without leaving any residue on the body. It also lathers easily. The shape of the soap is such that it can be held easily without any slipping. The price is also quite affordable as compared to its counterparts. The multiple size options and variants available in this soap make it easy to try it before buying multiple packs. It kills 99% of the bacteria and can be used for the body as well as the face. The fragrance and shape of the soap make it easy to hold it and refreshing. It lathers well and leaves the skin clean without any residue. The soap cannot control body odour very well and some people still might need a deodorant. It becomes difficult to use the soap once it gets smaller as it slips easily. This antibacterial soap is great for athletes and people who workout often as it washes away all the sweat and the bacteria that develops on the skin due to excessive sweating. One of the most popular antibacterial soaps available in the market, the gold soap from Dial works well for all skin types. It is available in four scents and comes in a pack of three. It rinses well and produces a rich and creamy lather to clean the skin thoroughly. The main ingredient of this soap is triclocarbon which is a powerful antibacterial agent. The soap does not have a very strong scent and does not irritate the skin in any way. It can also be used on the face if you are struggling with acne as it cleans the pores and decreases chances of acne. The price of the product is moderate. The soothing scent of this formula is good for people with sensitive skin. It has four scents to choose from and comes in multiple sizes. The size of the soap lasts well for a couple of months and it controls body odour well. The soap produces rich lather and rinses well off the skin. The formula can be a bit drying if used excessively on dry skin. The soap washes away bacteria rather than killing them. The gold variant of this antibacterial soap from dial is great for controlling body odour and keeps your skin protected for long hours. The mild scent and the soothing formula do not irritate the skin at all. Available in a pack of 12 bars, the Palmer’s complexion bar is formulated with vitamin E and sulphur and is designed to keep your facial skin clean and clear. It is good for acne-prone skin and keeps dirt and oil under control while killing bacteria that cause skin infections. The formula can dry your skin a little bit so it is advised to use a lotion after use. The soap is good for all skin types including sensitive skin and has a very mild scent. The price of the soap is quite affordable and you get 12 soaps so you get sorted for a year or so. This soap is specially formulated for acne-prone skin and keeps the pores clean. It clears out the complexion and works well on blemishes too. It does not irritate sensitive skin and has a very mild scent. The price of the soap is very affordable and you get a pack of 12 soaps. The formula dries out the skin and takes some time to show visible results. The soap is not available in a single pack so you have to invest in the whole pack. This antibacterial soap is good for keeping your face clean and acne under control as it kills acne-causing bacteria and unclogs pores also. The formula is very soothing and works well on all skin types. A medicated soap containing triclosan, the Gamophen medicated soap is good for controlling acne and body odour. It has many antibacterial properties and cleans the skin by removing excess oil and dirt. It makes the skin feel very soft and smooth if you use it regularly. Regular use also helps to unclog the pores and protect the skin from infections. The soap is big enough to be held easily but is a bit expensive as compared to other soaps. It lasts for 1-2 months depending on the usage but keeps body odour away for the whole day. The medicated formula cleans the pores and controls body odour for the whole day. The soap reduces acne by killing acne-causing bacteria and does not dry out the skin. The soap does not have a strong scent and rinses well after wash. Regular use makes the skin feel soft and smooth. The price of the soap is higher than other antibacterial soaps. It takes time to show results and reduces acne slowly. This medicated soap is very beneficial for people who struggle with body odour as it gives instant results in controlling body odour. It has a very mild scent and lathers well to clean the skin thoroughly. This sulphur-based antibacterial soap is recommended by dermatologists for treating topical infections and for its antibacterial action. The soap cleans clogged pores and is great for people with sensitive and acne-prone skin. It does not irritate the skin at all and lathers well. The soap has a medicated fragrance which does not seem too strong. It rinses easily and leaves the skin oil-free and clean. It does not dry out the skin like other sulphur antibacterial soaps. The price of the soap is high since it has a large size which lasts well for a few months and the medicated formula makes it worth it. It works well for oily and acne-prone skin and keeps bacteria growth under control. It is suitable for sensitive skin and does not leave the skin dry. The formula has a soothing fragrance and lathers easily to clean the skin. It keeps body odour under control and lasts well for 2-3 months if used daily. The price of the soap is a bit high for its antibacterial benefits. People might find the scent of the soap a bit irritating if they are used to fragranced soaps. This sulphur soap is a good option to consider if you indulge in a lot of physical activities that lead to sweating. It works on all types of topical concerns and treats them in just a few weeks. If you are looking for an antibacterial soap bar with exfoliating formula, this vegan bar soap from Noble Formula comes with antibacterial and antifungal properties and exfoliates the skin well. It is available in three size options and you can choose from four flavours which include mango, argan, and emu. It is a great soap for people suffering from eczema and psoriasis and relieves dryness and itching from the first use itself. The soap contains mango butter and cocoa butter which soothe the skin and olive oil which nourishes it. It also contains oatmeal which gently exfoliates the dead skin cells. The price of the soap is moderate. The formula is quite nourishing and exfoliates the skin gently to remove dead skin cells and bacteria. The mango and cocoa butter keep the skin moisturized and control dryness and itching. The soap doesn’t contain artificial lathering agents which damage the skin. The formula does not have an irritating scent. It is advised to do a patch test first on the skin as the formula can be a bit strong. The soap is a little difficult to hold because of its shape and size. The vegan mango butter soap bar relives dryness and itchiness and works well in killing bacteria that cause skin infections. The oatmeal is very soothing on the skin and the formula is suitable for people with eczema and psoriasis too. With a calming lemongrass and lavender scent, the activated charcoal soap from The Yellow Bird is available in two sizes and seven soothing scents to choose from. It contains certified organic ingredients and provides relief from all major skin concerns. The activated charcoal acts as a natural detoxifying agent and cleans the pores naturally. The soap also contains shea butter and aromatic oils which soothe the skin and uplift the senses. It is free of sulphates and parabens. The soap is a bit expensive as compared to other antibacterial soaps but the natural ingredients make it worth the high price. This soap contains all natural ingredients and is free of artificial chemicals which irritate the skin. Activated charcoal helps to detoxify the skin and has antibacterial properties. The soothing lemongrass and lavender scent makes the skin feel clean and fresh all day long. The formula does not leave any oily residue on the skin and rinses easily. The formula can be a bit drying on the skin if used excessively. The price is high because of the presence of organic ingredients. This organic antibacterial soap is very gentle on the skin and the soothing fragrance of lemongrass and lavender refreshes the skin. The organic ingredients work well for sensitive and dry skin and keep the skin protected from infections. 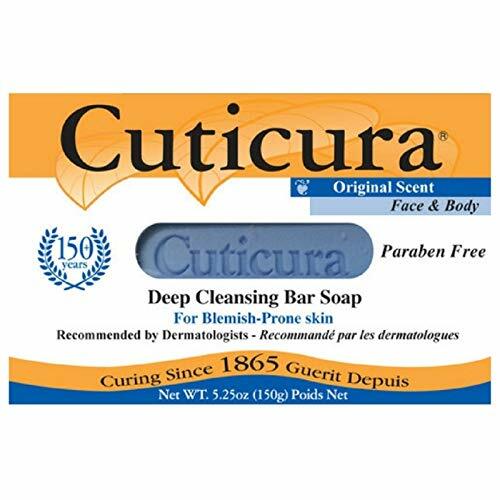 Specially formulated for blemish-prone skin, the Cuticura deep-cleansing bar contains nourishing ingredients for keeping your face and body clean and healthy. It is free of parabens and has a mild scent that does not irritate the skin. The formula is a bit drying so you need to apply a moisturizer after using this soap. Regular use helps to control body odour and acne breakouts. The soap contains triclocarbon which is an effective antibacterial agent to keep germs at bay without overly drying the skin. The price of the soap is affordable. The soap formula is quite gentle on the skin and is free of parabens. It does not irritate the skin and rinses easily without leaving any residue. Regular use helps to clear acne and blemishes from the skin. The price of the soap is affordable as compared to its size and quality. The first few uses can cause a burning sensation on the skin. The soap dries out the skin so you need to apply a moisturizer after use. This is one of the most popular antibacterial soaps available in the market as it is very gentle and clears up the skin by fading away blemishes and acne breakouts along with killing the bacteria. 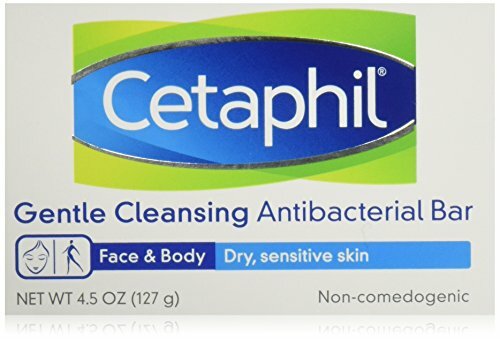 Cetaphil is one of themost popular skincare brands for sensitive skin and this cleansing bar from the brand is designed for keeping dry and sensitive skin clean and healthy. It has a mild formula without any soap ingredients that dry out the skin. It can be used on both face and body and comes in a pack of six bars so you can buy the whole pack for the family. The soap is hypoallergenic and unscented. It does not clog the pores due to the non-comedogenic formula. The price of the soap is affordable as you get six soaps at a very reasonable price. The non-comedogenic and hypoallergenic formula works well for all skin types. The soap does not contain any artificial soap ingredients which irritate the skin. You can buy a pack of multiple soaps at a very affordable price. The antibacterial properties of the soap help to keep acne and skin infections under control. The soap does not lather a lot due to the absence of lathering agents. The soap is not available in a single pack so you need to buy the six soaps. This is a very gentle soap that can be used on face and body and cleans the skin without leaving any residue or oil. It clears acne marks and pimples and has a powerful antibacterial action that prevents any further infections. Made with virgin coconut oil, this antibacterial soap acts as a natural deodorant and has a very nourishing formula. It is available in four scents and contains all natural ingredients. The formula is unscented so it can be used by people with a sensitive skin also. The soap has a mild fragrance of coconut and makes your skin feel clean and soft after use as it contains coconut oil. It produces a good lather but does not leave any residue on the skin. The price of the soap is moderate but you get two soap bars which lasts for 3-4 months easily. 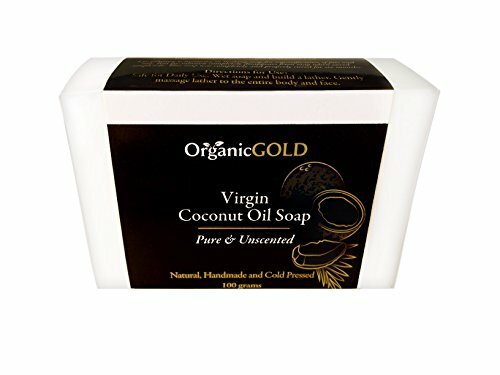 The soap is made up of virgin coconut oil which nourishes the skin and extracts impurities. The formula controls body odour well and kills bacteria naturally. The unscented variant is suitable for dry and sensitive skin. The soaps last for 3-4 months and you get 2 soap bars at a reasonable price. The natural formula can cause a burning sensation if used excessively. The soap is a bit heavy so it needs to be held carefully to avoid slippage. The formula of this soap is very gentle as it contains virgin coconut oil and controls body odour along with providing antibacterial and antifungal benefits. The mild coconut fragrance adds a hint of freshness to the soap. The formula of the soap should be nourishing and should make the skin feel clean and refreshed after use. Some soaps cause a lot of burning sensation and should be avoided as the formula might be too strong for people with sensitive skin. Make sure to check the ingredients label of the soap to see if contains any actual antibacterial agents like sulphur or triclocarbon. Read the customer reviews of the soap you are considering to buy as these can give you a genuine idea of how the soap works for your skin concerns. You can also share your own concerns on these forums to get answers from people who have used the product before. Take these reviews with a pinch of salt as not all formulas work in the same way on all skin types. Determine your skin type and concern before investing in an antibacterial soap. Your skin type can play a huge role in how a soap works on your skin so proceed accordingly. Do not go for very harsh soaps if you have a sensitive skin as this can irritate the skin. Check the soap formula by doing a patch test before you use it on the body and the face. Antibacterial soaps can be a little pricier as compared to regular soaps as they contain antibacterial agents and natural organic ingredients which can cost a little more. They are totally worth the investment but make sure that you buy a single soap before investing in a pack of multiple bars. A good antibacterial soap can cost anywhere between 4$ to 15$ depending on its brand and formula. So these are some of the most popular antibacterial soaps available in the market that should be used to keep your skin clean and healthy for long hours. Using an antibacterial soap has many benefits as it also controls body odour and improves the condition of the skin in the long run. These soaps keep bacteria growth under control and also unclog the pores of the skin that are filled with oil and dirt. Have you used an antibacterial soap before to maintain your skin? Is it possible if I use antibacterial soap on my face? Yes, you can use. But it doesn’t mean that it’s a good way because it may be too harsh with strong ingredients. I suggest you just wash your face with a mild soap or a non-soap cleanser. I’m using antibacterial soap but I wonder what soap is antibacterial? Soaps that contain antibacterial ingredients is mild liquid. Triclosan is also antibacterial ingredient in soap to kill germs and bacteria on your skin. Gamophen Medicated Soap is my best clean and clear.